Here is a collage of six of my silky pictures. Which suggests silky to you? Tomorrow begins a month long prompt: writing. I can’t wait to see how I can make writing into wonderfully interesting photos! This entry was posted in making, photography and tagged iphoneography, photography, sdawpphotovoices, silky, textures on September 30, 2013 by kd0602. Earlier in the week I posted about being a Connected Educator. Since then I’ve also been thinking about those educators who are connected but not yet putting their voices out in the digital space professionally. Lurker is the term I’ve heard to describe people who read on social media but don’t comment or post themselves. But lurker has such an evil sound to it–as though they lurk in order to gain information for underhanded reasons. In some ways they seem to me to be listeners, like those students in my classroom who are soaking everything up like sponges but can’t yet bear to raise their hand and make a public comment. Like the students in my classroom, I suspect that those digital listeners will at some point begin to comment and post for themselves, they just aren’t ready…yet. And since I started this blog (almost three months ago), I have had many instances of people making comments about my content when I’ve had no evidence of their interaction. It feels a bit odd at first. Almost like someone is eavesdropping on a conversation that they are not participating in. But then again, I am making a choice to put my writing and thinking out in the public sphere. And whether people chose to comment or “like” my blog post is a decision for them to make. It also reminds me as a reader of blogs and other social media that I read substantially more than I comment or otherwise indicate my presence. And I also know that sometimes it just takes the right condition to get someone to dip their toe into the social media waters. If you listen to the NWP radio show on being a Connected Educator you will hear Abby and Janis and Barb talk about getting started and how much it helps to have support, like when our SDAWP teachers take on the Twitter account as @SDAWP_Fellow for a week. (We adapted that idea from Sweden’s practice of having a citizen take on the country’s Twitter account.) It’s also like having Barb and Matt’s support when trying out blogging on our collaborative blog, SDAWP Voices. 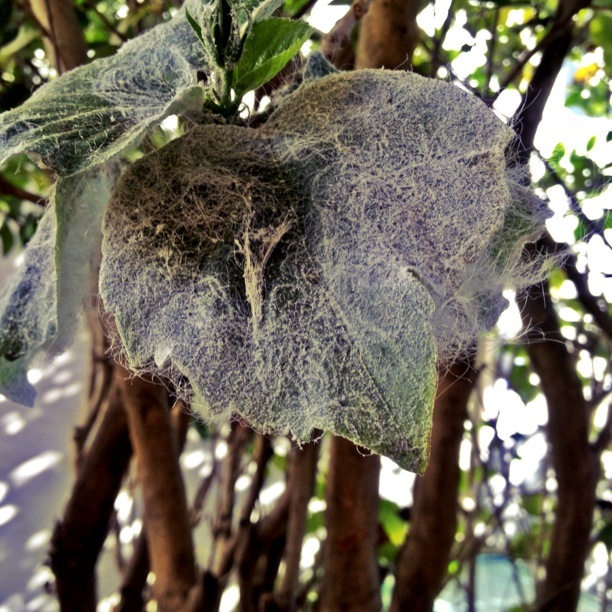 Today for my #sdawpphotovoices photo-a-day I took a photo of what I thought was some kind of fungus making a silky white coating on the leaves of our hibiscus plant. When I posted it to Instagram and Twitter, I got a response from one of my colleagues from my school site via Twitter telling me that this “fungus” was in fact white flies. I knew my colleague had a Twitter account, but she seldom tweets. I do try to nudge my colleagues when I see something that I think will interest them by “mentioning” them on Twitter. (I know I’m more likely to respond when someone “elbows” me and points me to something that has been posted.) I did this on Friday with my colleague when I saw an app I thought she might find interesting. And she acknowledged that tweet by replying. And then today, without a nudge, she shared valuable information with me about my plant. There are stages to being connected. Most people start slow (I know I did) and then work up to more active participation. For most of us that’s how we learn to do a lot of things. We watch, we listen, we test, we get some feedback and then continue to increase our confidence and participation–or abandon that thing altogether. As educators we can’t afford to abandon digital literacy or being connected educators, but it isn’t necessary to jump in the deep end. There are lots of support systems out there. In what ways are you connected? What is the one thing you will do in the next week to increase your connectedness? Will you comment on a blog? Respond to a tweet? Tweet a link to an interesting article or blog post? Start a Twitter account? (You are welcome to follow me @kd0602) I’d love to know if you are willing to post your goal as a comment! This entry was posted in Connected Learning, digital tools, photography, teaching and tagged listening, lurkers, NWP, SDAWP, Social media, Twitter, Twitter Fellow of the Week on September 29, 2013 by kd0602. Maintaining an extended photo-a-day practice (mine has gone on for over a year now!) means figuring out how to keep it interesting and creative. I depend on my friends to help me think through new ideas and consider whether my ideas are feasible or not. So all month in our photos I invite you to consider writing in the broadest sense. Where will this open-ended experiment take you? Will you find it restrictive or inspiring? And as always, take some time each week to reflect on your photos, write a blog post or comment sharing those thoughts, select a favorite photo, or create a collage and share it on this post. Be sure to post your photo each day to Instagram, Twitter, Facebook, or Flickr using the hashtag #sdawpphotovoices. (You can post anywhere—if you want others to be able to follow your photos, Instagram and Twitter are best!) For more information about posting click here. 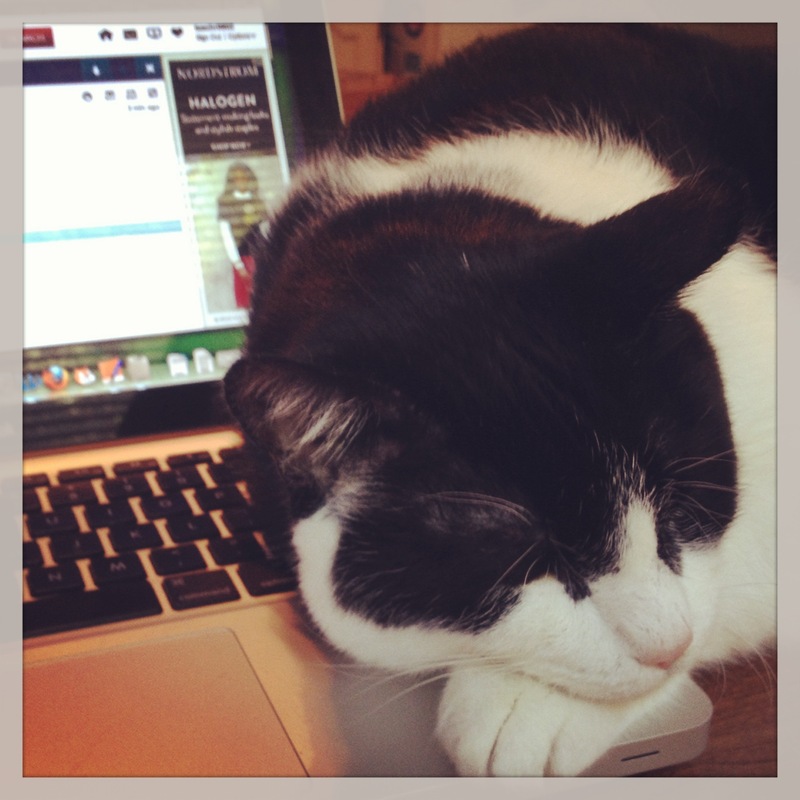 At the end of each week you’re also invited to curate your pictures from the week and select one to highlight. You might post it on your blog along with some musings about why you selected it. If you don’t have a blog of your own, you have a couple of choices—you can create a blog (be sure to share it with us by including your blog address in the comments here—or better yet, tweet it using the hashtag #sdawpphotovoices) or you can post to the SDAWP Voices blog. As the month goes on, come back to this post to link up your curated photos! Click on the link up button below and add your favorites. Or post a comment with an image on this post! This entry was posted in Connected Learning, digital tools, making, photography, writing and tagged iphoneography, National Day on Writing, photo-a-day, photography, sdawp voices, sdawpphotovoices, writing on September 28, 2013 by kd0602. They are saturated with learning experiences. Today we painted. 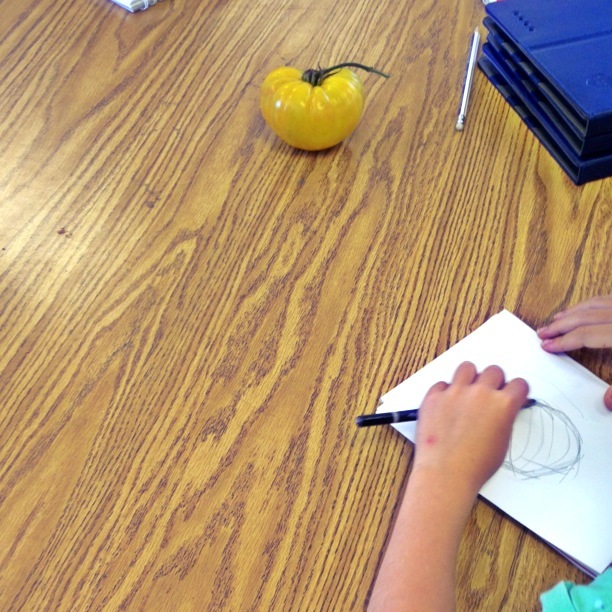 But it was just a part of a series of experiences to help students look closely, notice details, and then learn to sketch roundness by using curved lines and shading with their sketch pencils. They started with pumpkins harvested from our school garden. 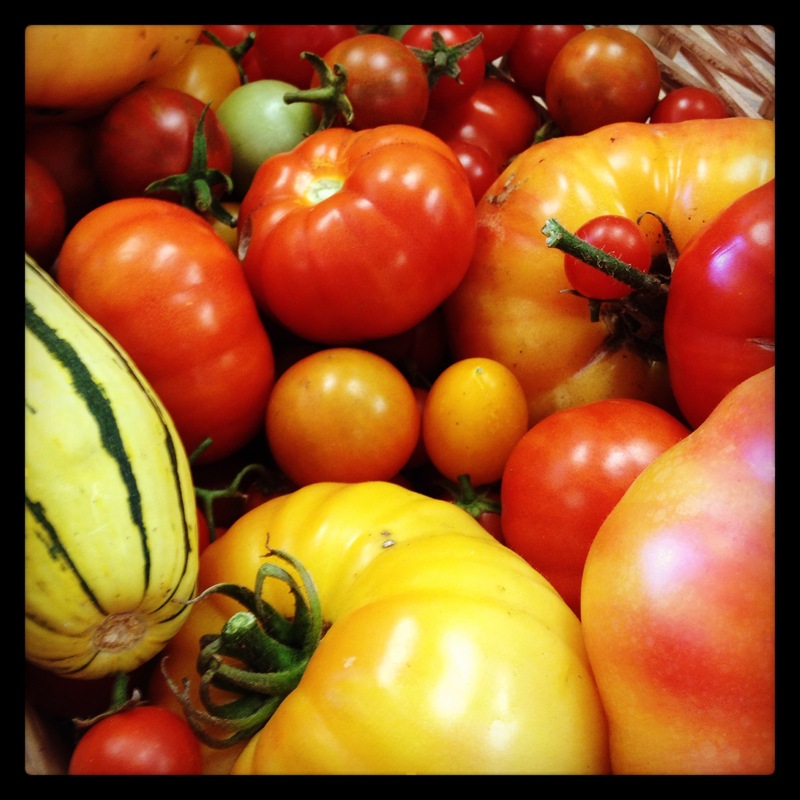 They moved to tomatoes, also harvested in the garden. 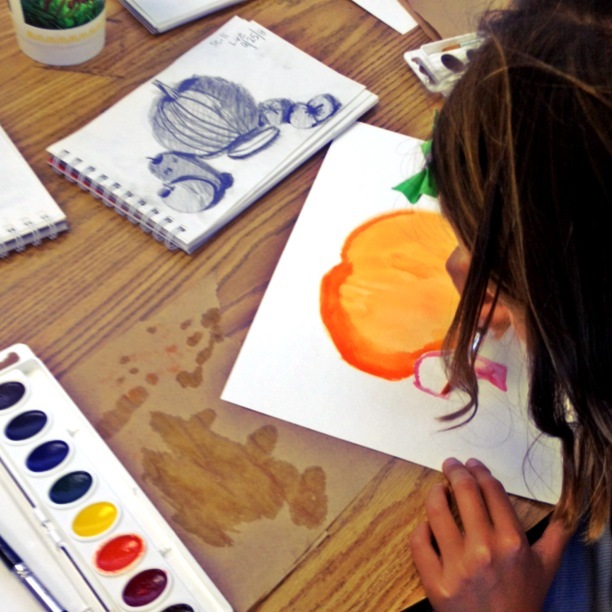 They studied Vincent Van Gogh and learned about the concept of still life. They arranged their own still life composition and photographed it using their iPads. They used the photo as a guide for sketching their unique composition–and also learned some techniques for showing the overlapping of the fruits and vegetables. And then today they tried the same techniques using watercolor paints. 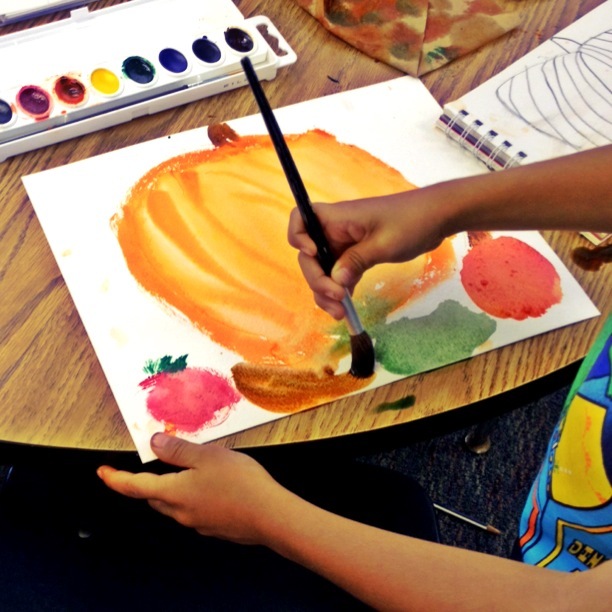 These six, seven, and eight year olds saturated their compositions with the brilliant colors of fall based on their experiences with the actual objects. In this photo you can see the gorgeous sketch (that the student made earlier this week) that guided this careful painting. Saturating students in a variety of experiences related to a topic allows for deeper and more meaningful learning. This learning is not just about art–although the art is beautiful–it’s also science and history and math and reading and writing…and so much more. 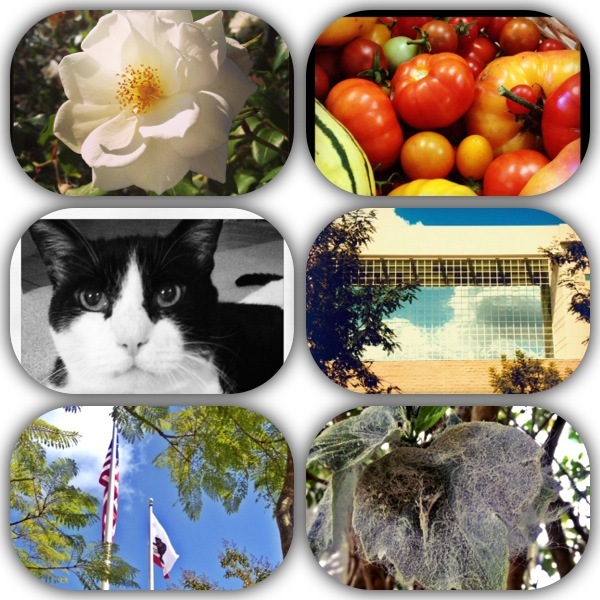 And conveniently, this week’s Weekly Photo Challenge is saturated. It talks about color…but there is so much more to saturation than color, in my opinion! How do you saturate yourself and your students in learning experiences? This entry was posted in Connected Learning, making, nature, photography, teaching and tagged Color, experience, fall, observation, painting, postaday, saturated, sketching, teaching on September 27, 2013 by kd0602. I did my civic duty this morning–I showed up for at the county courthouse at 8am for jury duty. And after a full fifteen minute pep talk from a judge trying to convince us all about the importance of our presence and the value of the jury system…and even quoting (from memory, as he pointed out) from the Declaration of Independence (not the preamble–the “stuff” in the middle), the mood in the room still seemed that of obligation, anxious waiting, and whiling away time. The next fifteen minutes were spent on a video that reiterated the importance and value of serving as a juror and explained a bit about how the courtroom operates. (Don’t take it personally if the lawyer excuses you, it’s all part of how the law works!) And then we spent the next ten minutes or so filling in the back of our summons assuring that we were legally qualified to be jurors, signing our names and including a contact phone number. As we passed the paperwork in, the approximately 300 potential jurors were entitled to our first ten minute break (we’d been there less than an hour). As you can see, the jury lounge is not a particularly comfortable or visually stimulating place. There are a few tables around the edges of the room for those who want to work on their laptops (although not nearly enough electrical outlets) and some free, although spotty, internet access. People read, chatted, knitted, played with their devices, slept, and some did work (I can raise my hand for that one!). After about another hour we were granted another break–the difference between a break and not being on a break is that you can wander out of the jury room although the coffee cart in the hallway wasn’t much different than the vending machines inside. After three hours in the jury lounge, we were summoned for an announcement. 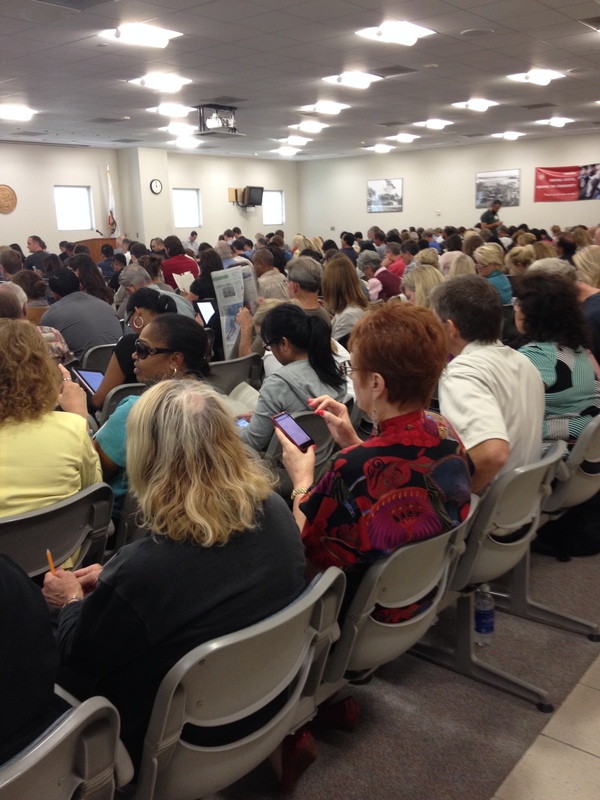 There would be no need of jurors today and all 300 + of us were excused. Be sure to clock out on your timesheet and leave your badge holder and pencil for others to use. Whew! I was relieved to be dismissed. Not because I don’t want to serve on a jury, but because the uncertainty of the when and how long make my life complicated. As a teacher, it’s hard to be at the courthouse wondering if I will be asked to return tomorrow–and then needing to arrange for a sub, make plans for someone else to carry out and miss all the intangible evidence of learning that can only be understood by being there. So I’m happy to have finished my duty for at least a year. 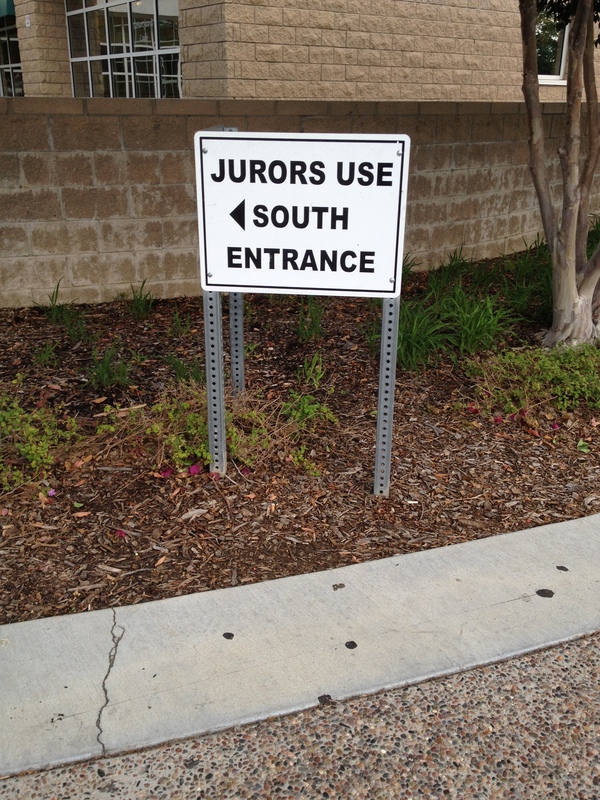 But I do worry about how this system works…and who is actually willing and available to serve on juries. After being dismissed I took a little time to walk through the buildings and take a closer look at this public place. To be honest, the place is bleak. 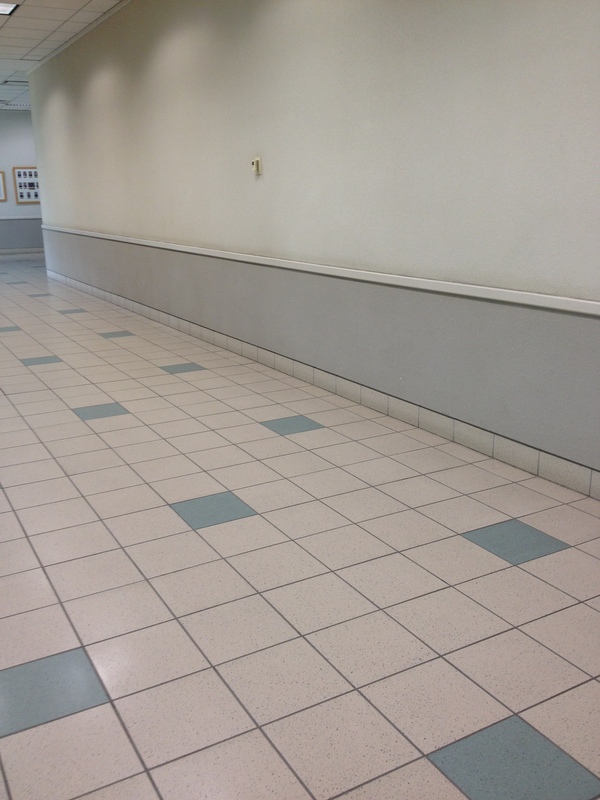 Long hallways with institutional white walls. No decoration, harsh lighting, guards at the doors, and lots of worried looking people waiting, and waiting, and waiting. As I left the building I took a few minutes to appreciate the beautiful fall day. Warm with a little breeze…and some silky, billowy clouds in the sky. 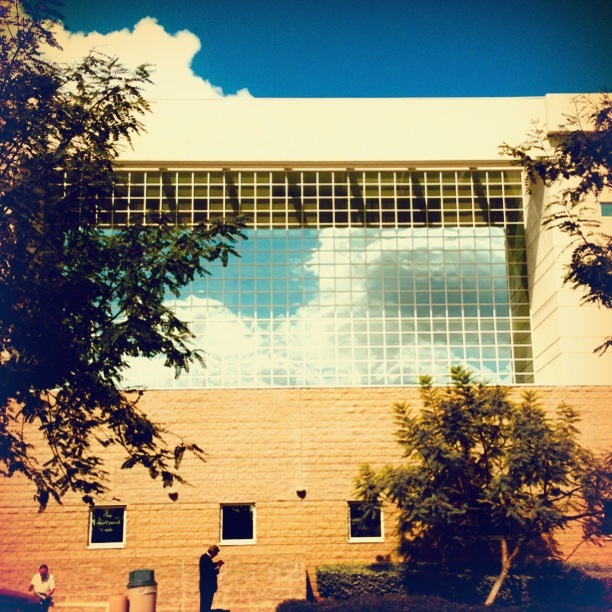 As I looked back at the courthouse I noticed that the clouds were reflected in the high windows above the entrance. This bit of beauty remains imprinted on today’s experience. Taking time for a learning walk always changes my experience…for the better. Slowing down, looking closely, and taking time to reflect creates opportunities for learning and new perspectives. I hope you make time for a learning walk soon. This entry was posted in making, photography and tagged Courthouse, iphoneography, Jury duty, learning walk, photography, reflection on September 26, 2013 by kd0602. What does it mean to be a connected educator? This is a question some National Writing Project (NWP) colleagues and I will be exploring on tomorrow’s NWP radio show Thursday afternoon. “Take it from an educator or thousands” is the call of this year’s Connected Educator Month set for October 2013. 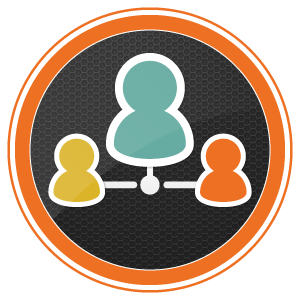 A partner of the NWP through our Educator Innovator Initiative, Connected Educator Month (CEM) seeks to broaden and deepen educator participation in online communities of practice and move towards a more fully connected and collaborative profession. 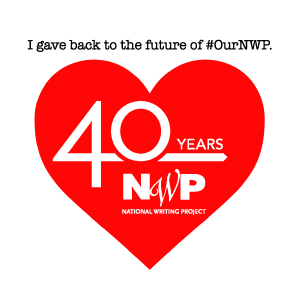 This NWP Radio will explore what it means to be a connected educator in the 21st century, what the implications are for writing project sites today, and how to get involved in CEM in October and connect with the larger Educator Innovator Initiative throughout the year. I guess it’s time to claim that label for myself. I am a connected educator. But what does that mean? For me it means access to professional resources…quickly and easily, and from educators from all over who I have come to know and trust from their online presence. I do know some of these people from face-to-face interactions while others I only know virtually. We connect on Twitter, Facebook, Google+, Instagram, and through our blogs. And while our interactions are primarily professional, we do get to know each other as people as well. And being connected means more than that. Being connected pushes me to try on and develop my digital literacies. 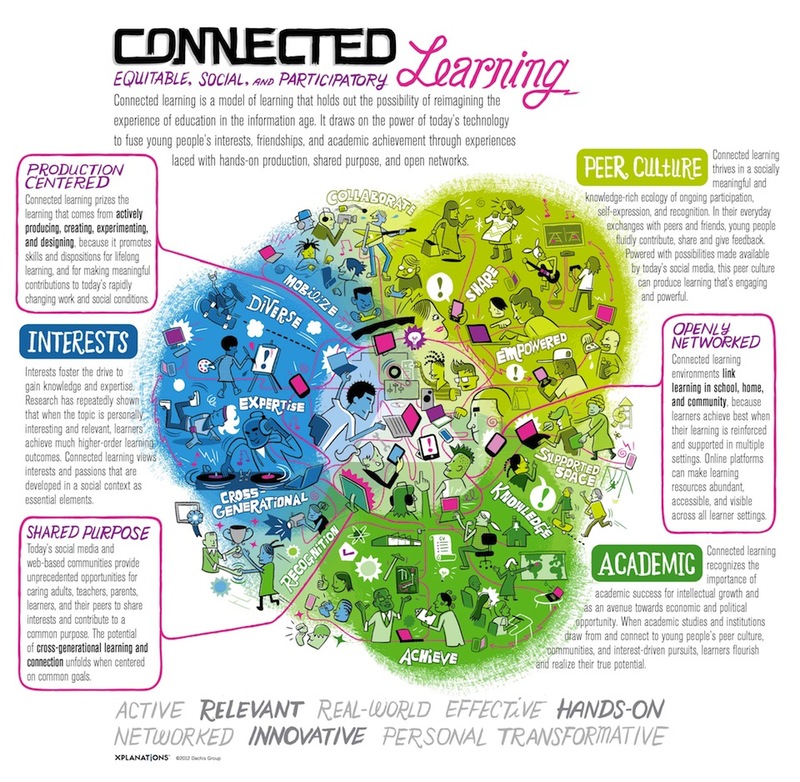 This summer I explored Connected Learning principles through the CLMOOC (Connected Learning Massive Open Online Collaboration). I focused on “making”–mostly through my interest in photography, experiencing firsthand the power of interest-driven and peer supported learning. I tried new tools and pushed myself to be more open and public with my own processes. As a result I learned a lot, connected with an amazing group of educators, and had tons of fun! And all of that also transfers both into my classroom and to my local writing project (SDAWP). And I also learned that all of this is an ongoing work in progress. You don’t suddenly become a connected educator and then you’re done. It’s a lot like being a writer. You’re a writer when you write. You’re a connected educator when you stay connected–and produce as well as receive. It’s the give and take that makes all the learning possible and supports us, as educators, to support our students in their connected lives. I hope you can join us for the radio show tomorrow (or listen to the archive). I look forward to the opportunity to talk about being a connected educator with a group of others exploring this possibility. Oh, and October is Connected Educator Month…how will you connect? This entry was posted in Uncategorized on September 25, 2013 by kd0602.